Summary: We report two patients with an idiopathic transdural spinal cord herniation at the thoracic level. Phase-contrast MR imaging was helpful in showing an absence of CSF flow ventral to the herniated cord and a normal CSF flow pattern dorsal to the cord, which excluded a compressive posterior arachnoid cyst. Idiopathic transdural spinal cord herniation (ISCH) is considered a rare cause of progressive myelopathy (1–15). We report two patients who presented with a Brown-Séquard syndrome. In both cases the preoperative diagnosis of transdural herniation was based on the combined findings of standard and phase-contrast MR imaging. A 54-year-old woman had a 5-year history of loss of temperature sensation and dysesthesia in the left foot. She also reported a burning sensation over the left leg. The symptoms had slowly progressed, and there was a progressive ascending weakness and numbness in the right leg. Examination revealed decreased pin-prick and temperature sensation on the left below the T8 level. A mild decreased muscle strength (clinical grade of motor power: 4/5) of the right leg with spasticity, hyperreflexia, and an extensor plantar response were observed. CSF analysis was normal. Plain films of the thoracic and lumbar spine were unremarkable. Sagittal T1- and T2-weighted MR sequences obtained on a 1.5-T imaging unit showed ventral displacement of the spinal cord at the level of T6 (Fig 1A). The cord was in close association with the posterior surface of the vertebral body and appeared atrophic. Subarachnoid spaces posterior to the tethered cord were enlarged. 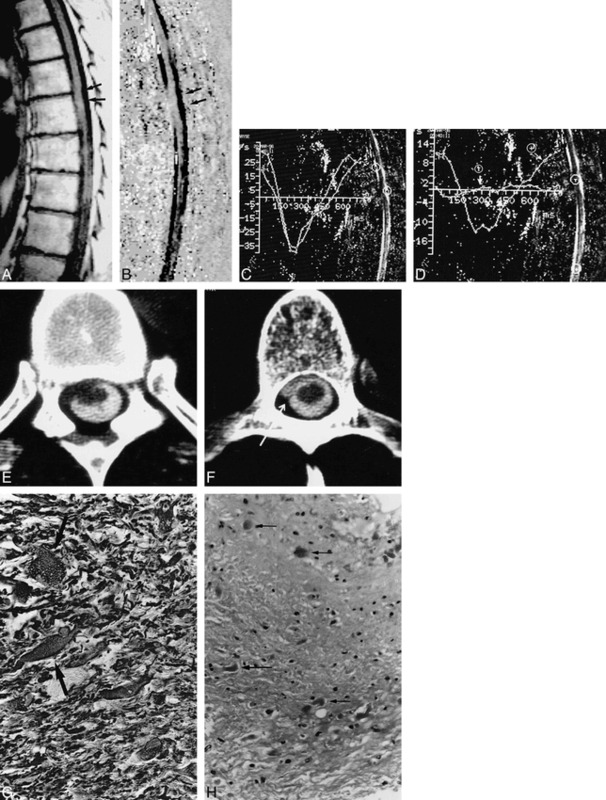 No signal abnormality was observed in the spinal cord on either T1- or T2-weighted MR images. Case 1: spontaneous spinal cord herniation. A, Sagittal T1-weighted MR image shows ventral displacement of the spinal cord at the T6 level (arrows). B, Sagittal velocity image during systolic phase, 300 milliseconds after the R wave of the EKG. Dark areas correspond to craniocaudal flow. No flow is visible on the ventral side of the spinal cord at the T6 level. Normal flow is seen in the posterior subarachnoid spaces. A posterior arachnoid cyst is unlikely. C and D, Evolution of CSF flow during the RR cycle of the ECG. By convention, caudal flow is represented as negative. CSF velocity curves measured in the anterior subarachnoid spaces superior to the cord herniation and in the posterior subarachnoid spaces at the level of the herniation show similar normal patterns (C). There is no evidence of an associated posterior arachnoid cyst. Cursors have been placed at the level of the herniation (T) and below it (+). There is limited cord motion at the level of the herniation, as manifested by a minimal deflection of the pulse wave, T, from zero, whereas normal cord motion is identified below the herniation (D). E and F, CT myelography at the level of the cord herniation (E): the cord is ventrally displaced and protrudes into the left anterolateral epidural space. Just below the cord herniation, an anterior pseudomeningocele is filled with contrast medium (arrow, F). G, On histopathologic section, hypertrophic astrocytes are visible in some areas (arrows) (alkaline phosphatase-antialkaline phosphatase method for GFAP, original magnification ×400). H, Histologic section shows chronic reactive changes with Rosenthal fibers (arrows) and mild pilocytic gliosis (H and E, original magnification ×250). Because a posterior intradural arachnoid cyst was considered a diagnostic possibility, a phase-contrast MR imaging study was obtained. We used a retrospective gated 2D sagittal fast imaging with steady-state precession sequence with parameters of 70/13/1 (TR/TE/excitations), a flip angle of 15°, velocity encoding in the craniocaudal direction, and flow-sensitivity set to ± 10 cm/s. Normal pulsatile kinetics of the posterior subarachnoid spaces were observed (Fig 1B–D). No CSF flow was visible ventral to the cord. Myelography and CT myelography confirmed the ventral displacement of the cord at the T6 level (Fig 1E). At the T8 level, there was a right anterior pseudomeningocele filled with contrast medium (Fig 1F). The subarachnoid spaces posterior to the spinal cord were normal. On the basis of these studies, a diagnosis of transdural herniation of the spinal cord at the T6 level was made, with no evidence of a posterior intradural arachnoid cyst. After a T5–T7 laminectomy, the dura and arachnoid were opened at the midline. Herniation of the right ventrolateral aspect of the spinal cord through a ventral ovoid dural defect was identified. Herniated tissue consisted of a yellowish, tumorlike mass originating from the cord. Cord herniation was reduced and the herniated mass was partially resected. The dural defect was sutured and sealed with muscle. Microscopic examination showed a modest increase of cellularity in some areas, consisting of hypertrophied astrocytes (Fig 1G) or pilocytic gliosis and Rosenthal fibers (Fig 1H) associated with normal or dilated axons. Vascular hyalinization with perivascular cuffing of lymphocytes and intraparenchymal lipid-laden macrophages was also noted, consistent with chronic reactive changes. In the postoperative course, a proprioceptive deficit of the right lower limb appeared with aggravation of the spasticity. Progressively, the neurologic status of the patient improved, although incompletely. A 70-year-old man had a 6-month history of progressive gait disturbance with marked exacerbation for 2 weeks prior to admission. Neurologic examination revealed a reduction in pain and touch sensation below the T7–T8 level. Hyperreflexia in both legs was noted, and a Babinski sign was present on the right side. There was no frank motor deficit. MR imaging showed dilatation of the dorsal subarachnoid space and deviation of the spinal cord ventrally at the T5–T6 level (Fig 2A and B). A posterior arachnoid cyst or a transdural spinal cord herniation was considered. 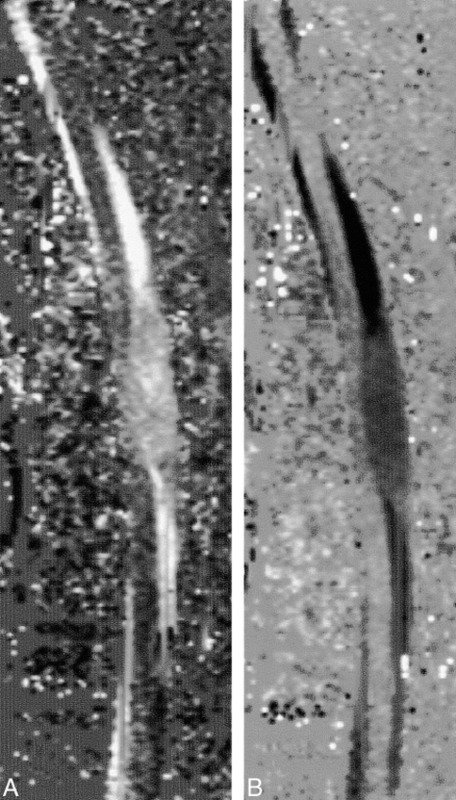 Phase-contrast MR imaging showed normal CSF flow in the posterior subarachnoid space, and no CSF flow was noticeable on the anterior side of the cord (Fig 2C). From these findings, spinal cord herniation was suspected. A, Sagittal T2-weighted MR image shows ventral displacement of the spinal cord at the T5–T6 level (arrowheads). B, Axial T2-weighted MR image at the level of the cord herniation shows anterior cord displacement and loss of the anterior subarachnoid spaces. Loss of phase coherence is responsible for the dark signal in the dorsal subarachnoid space. C, CSF velocity curve measured in the posterior subarachnoid spaces at the level of the herniation shows a normal CSF velocity pattern. A posterior arachnoid cyst was considered unlikely. D, Postoperative sagittal T2-weighted MR image shows normal location of the spinal cord. A thoracic laminectomy was performed at T5–T6. On medial incision, ventral dura mater appeared to be duplicated. The herniated spinal cord protruded through a dural defect located on the inner layer of a duplicated dura mater. The herniated cord was reduced intradurally and the dural defect repaired. Postoperatively, there was rapid improvement of the sensory disturbance and the follow-up MR imaging study confirmed reduction of the cord herniation (Fig 2D). ISCH is a rare condition: including our two patients, only 29 cases have been reported (1–7, 9–12, 16–19). The age of the patients described (19 women and 10 men) has ranged from 22 to 71 years (mean age, 50 years). Neurologic symptoms were generally slowly progressive, and patients presented most often (81%) with a Brown-Séquard syndrome. All the reported cases have been located between T2 and T10, with 79% between T4 and T8. The dural defect occurred in the ventrolateral dura in 18 patients and in the ventral dura in the remaining 11 patients. Since the first description by Wortzman et al (12), the increasing number of new cases reported in the literature suggests that the frequency of the disease is probably underestimated. The pathophysiology of this condition is unclear. The spinal cord may herniate into a congenital extradural arachnoid cyst (4–6, 11, 16) or into an anterior meningocele (3). A preexisting dural defect is a likely prerequisite to ISCH (2), and the defect may be congenital or the result of an unrecognized traumatic event (10). Spinal cord protrusion though a defect of the inner layer of a duplicated dura mater has been reported by several authors (3–6, 11, 16). Clinical symptoms, MR imaging presentation, and surgical observations in our patients are in accord with those described previously. None of our patients had a history of traumatic injury to the spine or of a complicated birth. In our first patient, CT myelography showed an aspect compatible with that of spinal cord protrusion into an arachnoid pouch. Our second patient had surgical evidence of a duplicated ventral dura mater. There is little quantitative information available concerning CSF flow at the thoracic level. Maximum velocities observed at the level of the conus medullaris vary from 10 mm/s (20) to 28 mm/s (21). We considered a velocity range set to 10 cm/s to be reasonable for quantitative measurements at the thoracic level. Phase-contrast cine imaging was valuable in the diagnosis of ISCH by demonstrating an absence of pulsatile CSF flow at the ventral side of the spinal cord at the level of the herniation. Absence of pulsatility of the spinal cord at the level of the herniation, as observed in our first patient, was another valuable sign of a tethered cord. 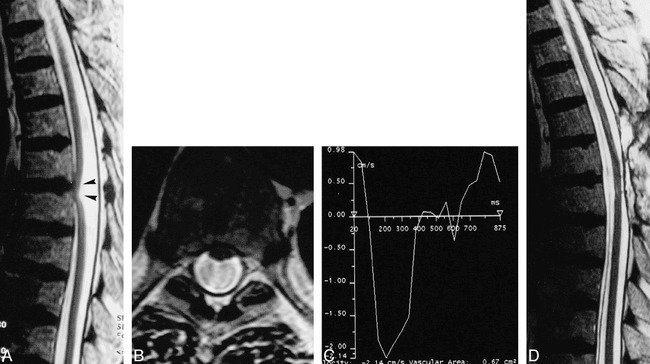 The MR presentation of ISCH is characterized by ventral displacement of the thoracic spinal cord. In our patients, we observed a sharp angulation of the dorsal side of the cord at the level of the herniation, which is more consistent with focal scarring than with posterior compression of the cord. Nonetheless, in a few patients (n = 5), association of ISCH with a posterior arachnoid cyst has been shown (4, 11, 13, 19). In those five patients, arachnoid cysts were demonstrated surgically, but, except for the patient reported by Slavotinek et al (19), the diagnosis was not supported by radiologic evidence. Radiologic demonstration of an arachnoid cyst may be difficult. These cysts often correspond to intradural diverticula (22), which explains why they generally fill with contrast medium at myelography. Moreover, their signal intensity is isointense with CSF on both T1- and T2-weighted MR images (19), and the cyst walls are generally not visible on standard MR images. Phase-contrast imaging may be useful for delineating the cyst when it is distended by showing decreased CSF flow within it (Fig 3). In our two patients, phase-contrast imaging showed a normal CSF pulsatile pattern within the dorsal subarachnoid spaces, a fact that strengthened our belief that these were not arachnoid cysts. A and B, Sagittal velocity images during diastolic (A) and systolic (B) phases show low CSF flow (gray areas). The contents of the distended arachnoid cyst are clearly visible along the dorsal side of the spinal cord. We observed a postoperative worsening of symptoms in our first patient, a complication that has been noted previously by others (10, 12, 13, 18). We think that the partial excision of the hernia, mistaken at surgery for exophytic tumoral tissue, was probably responsible for the neurologic complication. We therefore agree with Borges et al (2) and Sioutos et al (18) that the hernia must be preserved rather than transected or removed, because it may be partly a functional tissue. Another interesting point is the ambiguous histopathologic presentation of the gliotic tissue of the hernia may be mistaken for a low-grade astrocytoma. The same problem was encountered in the second patient reported by Hausmann and Moseley (3). At the upper and middle thoracic levels, the spinal cord is normally situated ventrally in the spinal canal. Pulsatile movements of the thoracic spinal cord are visible on phase-contrast cine imaging. The pulsatility of the posterior subarachnoid spaces is responsible for the anteroposterior kinetics of the spinal cord, which then tend to push it into further contact with the ventral dura. If a dural defect occurs at the thoracic level, CSF pulsatility constitutes a likely mechanism for the cord herniation. The mechanism by which dural defects occur remains obscure. A dural tear or leak may be idiopathic (23–25) or be the consequence of a minor trauma (26) or even of coughing (23). In this context, it is interesting to note that the patient reported by Masuzawa et al (6) presented with severe headaches, which disappeared after surgery. We have described the findings in two patients with surgically proved ISCH. The MR appearance was characterized by a sharp ventral displacement of the thoracic spinal cord. Phase-contrast imaging is the best technique for assessing the presence or absence of a posterior arachnoid cyst, as it affords better comprehension of the disease and explains how, even in the absence of an associated posterior arachnoid cyst, spinal cord herniation is possible when an anterior dural defect occurs at the thoracic level. Considering the poor immediate postoperative course in our first patient, we emphasize that herniated tissue must be preserved at surgery, especially in that histopathologic findings may be ambiguous. ↵1 Address reprint requests to P. Brugières, MD, Service de Neuroradiologie, Hopital Henri Mondor, 51 ave du Mal de Lattre de Tassigny 94000, Créteil, France.